San Francisco seniors may remember when wind gusts of 69 mph (111 kmph) caused the closure of the Golden Gate Bridge for the first time on December 1, 1951. The Golden Gate Bridge is one of the Wonders of the Modern World according to American Civil Engineers - a suspension bridge over the 1 mile wide/3 mile long Golden Gate strait that separates the city of San Francisco, California, from Marin County, California. The Golden Gate Bridge opened in 1937 and at 4,200 feet, until 1964 was the longest suspension bridge in the world. Engineers came up with a bridge design that could handle the swirling tides, currents, deep water, and frequent strong winds and blinding fogs. Opposition to the bridge came from the Department of War, Southern Pacific Railroad, and unions wanting local worker guarantees. Construction began on the Golden Gate Bridge in January 1933 and it opened on May 27, 1937. It took a little over 4 years, $35 million and the lives of 11 bridge construction workers who fell to their deaths, to complete the Golden Gate Bridge. 10 of the 11 men were killed in a single incident on Feb. 17, 1937, when a safety net failed after a scaffold fell. 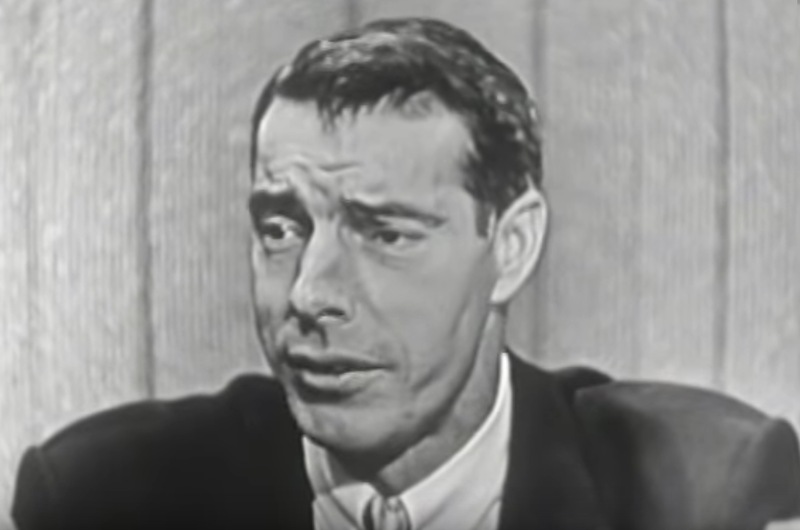 1951 had been a bad year for "Joltin' Joe" DiMaggio, as he sustained injuries and had a dispute with his New York Yankees Manager in July. He said he'd had "A poor year, but even if I had hit .350, this would have been my last year. I was full of aches and pains and it had become a chore for me to play. When baseball is no longer fun, it's no longer a game, and so, I've played my last game (on October 10 1951)." Joe DiMaggio played his entire 13 year MLB career for the American League New York Yankees and was inducted into the Baseball Hall of Fame in 1955. One of 9 children, he was born on November 25, 1914 in Martinez, California and grew up in San Francisco. Joe began playing pro baseball with his older brother Vince's Pacific Coast League team in 1932. A knee injury in 1934 almost ended his baseball career, but he recovered and the New York Yankees bought his contract, bringing him up to play on the team for the first time on May 3, 1936. The New York Yankees had been shut out of the World Series since 1932, but they won 4 World Championships in a row from 1936-1939. Joe DiMaggio married first wife actress Dorothy Arnold in November 1939 and their son Joseph Paul DiMaggio III was born in October 1941. World War II service disrupted DiMaggio's MLB career from 1943-1945; during that time, Dorothy and Joe DiMaggio were divorced (in 1944). 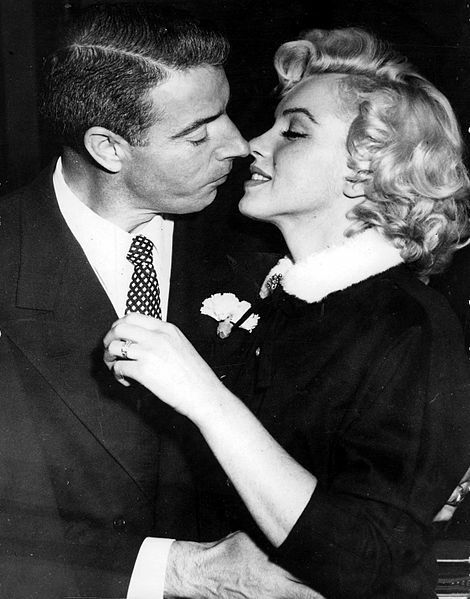 Joe DiMaggio eloped with Marilyn Monroe in January 1954, but she filed for divorce in October, a month after a public argument. Joe Di Maggio became a batting coach for the Yankees, and later a hitting instructor for the Oakland Athletics from 1968-1970. It was Joe DiMaggio that sprang Marilyn Monroe from a psychiatric clinic in February 1961 and it was DiMaggio that arranged for her funeral after her death in August 1962. For 20 years he had red roses delivered 3 times weekly to Marilyn Monroe's crypt. Joe DiMaggio never remarried; he had been a heavy smoker most of his life and was an 84-year-old octogenarian when he died in March 1999, having had lung cancer surgery in October 1998. Joe DiMaggio's last words? "I finally get to see Marilyn.". The original television series Dragnet premiered on December 16, 1951. Dragnet producer, creator and writer Jack Webb had played Sergeant Joe Friday on radio when the series began in June 1949, but he wanted someone else to star in the series when it transitioned to television for the baby boomer generation; he was overruled. Jack Webb and his fellow radio on-air partner, actor Barton Yarborough as Sergeant Benjamin "Ben" Romero", kicked off the Dragnet TV series. Barton Yarborough died unexpectedly of a heart attack on December 19, 1951 - just 3 days after the first television episode of Dragnet had been released, and the day after he had completed filming the second episode of the series. Eventually a new regular partner, Officer Frank Smith (actor Ben Alexander), was found for Joe Friday. Below, "The Big Grandma" episode of Dragnet featuring Jack Webb and Ben Alexander. Dragnet spawned 3 movies (1954, 1966, and 1987) and two remake series (1989-1990; 2003); the 1954 and 1966 movies starred Jack Webb, and the 1987 movie was a comedy starring Dan Aykroyd. Dragnet phrases that became pop culture: "The story you are about to hear is true. Only the names have been changed to protect the innocent." and "All we want are the facts, ma'am." (truncated to "Just the facts, ma'am."). Dragnet went off the air in August 1959, but was relaunched and ran from 1967-1970, still with Jack Webb as Joe Friday. Jack Webb was working on scripts for a Dragnet revival series when he died from a heart attack in December 1982, and the series was scrapped. The LAPD retired Jack Webb's badge #714 after Webb's death, and the LAPD provided an honour guard at his funeral. Webb was married 4 times and had 2 daughters; in addition to Dragnet, he created the popular baby boomer TV series Adam-12 and Emergency!.